For most people, driving represents freedom. Without a car, it’s difficult to run even simple errands, such as buying groceries or going to doctors’ appointments. Understandably, few older adults want to stop driving. 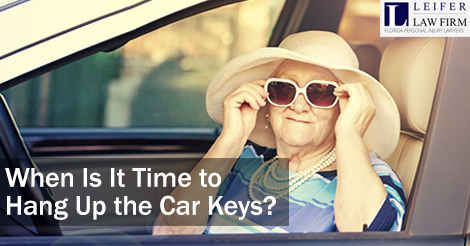 Many resist hanging up the keys for good, even when they really shouldn’t drive. As car accident lawyers in Boca Raton, we see our fair share of car accidents involving the elderly. If you are worried about an older parent being safe behind the wheel, you might be interested in the following statistics. On some level, most people know that older drivers have a generally higher risk of being injured in a car accident. What few people realize is just how startling these figures are. As of 2012, there were nearly 36 million drivers age 65 and older on U.S. roads. With the number of elderly individuals in the United States set to double by 2050, driving is poised to be a major concern for older adults. As much as we hate to admit it, the aging process takes a toll on the human body. In Florida, individuals age 80 and over must pass a vision test before they can obtain a renewal of their driver’s license. Aside from the vision screen, however, older drivers in Florida have no age-based restrictions. Although older drivers tend to be safer behind the wheel compared to other age groups, they experience injuries more often due to a higher rate of health problems. As AAA points out, 80 percent of adults in their 70s have arthritis. This can delay reaction times in the car, as arthritis sufferers often find it difficult and painful to twist their neck and spine. Older adults also have weaker muscles, less flexibility, and delayed reaction times compared to younger drivers. It is never easy to tell a parent or other senior that he or she is unsafe behind the wheel. For this reason, many people avoid speaking up about an older loved one’s difficulties on the road. No matter how uncomfortable you may feel talking to your older loved one about putting away the keys, it’s important to address the problem before someone gets hurt. Offer to Ride Along: Health experts recommend offering to ride along with an older parent. As a passenger, you can observe any unsafe behaviors as your parent or other loved one navigates the roads. Rather than simply declaring it’s time to retire from driving, make sure you can point to specific examples of potentially dangerous driving habits. Make Alternative Arrangements: Most seniors are reluctant to stop driving because they worry they won’t have any autonomy over their own lives. Reassure your parent by offering to provide rides or arranging a driver. This way, your parent can still feel independent while staying safe on the road. Your parent may even feel relieved to know he or she doesn’t have to worry about driving. Do You Have Questions about a Car Accident? After a car accident, you may wonder whether you need a car accident lawyer. The answer is a resounding yes. Protect your rights by speaking to a Boca Raton car accident lawyer about your case.